Luka Doncic has had an impressive season thus far. He averages 20.2 points, 6.7 rebounds, and five assists. Doncic's rookie season has been nothing short of phenomenal. He's had several highlight plays, which includes several shots and passes. In December, Doncic hit a nearly impossible 3-point shot to tie a game. The Dallas Mavericks were down 107-104 to the Portland Trailblazers. Doncic received the ball off of an inbound and took the tough shot. His shot forced the game into overtime. The Mavericks lost 121-118 but Doncic's shot was the highlight of the game. Doncic is playing well and he'll likely keep doing so. His performance this season has even earned him All-Star nods. Doncic is second in the West behind LeBron James. James has 2,779,812 votes and Doncic has 2,220,077. Doncic has more votes than Paul George, Kevin Durant, and Anthony Davis. At this point, he is the favorite for Rookie of the Year. But, does he have competition? Or, is Doncic the obvious choice? Luka Doncic was the third pick of the 2018 NBA draft. He was drafted by the Atlanta Hawks but they traded him to the Mavericks. The Hawks received Trae Young in exchange for Doncic. Doncic is a phenom out of Slovenia. He signed a five-year contract with Real Madrid of Spain and played with their under-18 team and reserve team before joining the main roster. His best season with Real Madrid was the 2017-2018 season. He averaged 12.5 points, 5.7 rebounds, and 4.7 assists in the Liga ACB. He also averaged 16.0 points, 4.8 rebounds, and 4.3 points in EuroLeague. Real Madrid plays in both leagues, so Doncic had an opportunity to showcase his talents in both leagues. He won a EuroLeague Championship, the EuroLeague MVP, and EuroLeague Final Four MVP in that season. His performance helped him become a projected top pick of the 2018 draft. Fans are enjoying Doncic and his game. The 6-foot-7 forward has impressive playmaking skills. Especially, for some his size. Playmakers of his size are becoming more common but Doncic is one of the best. And, he's just getting started. 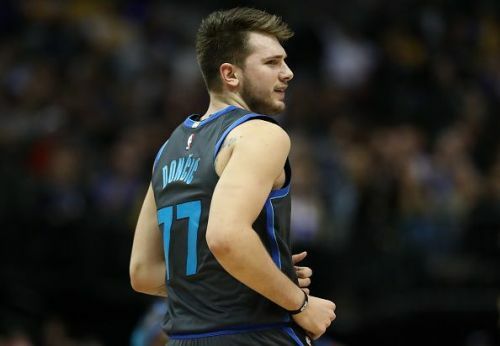 At this point, Luka Doncic is the Rookie of the Year. But, we cannot rule out his draftmates. DeAndre Ayton of the Suns, Jaren Jackson Jr. of the Grizzlies, and Trae Young of the Hawks are others players to consider. Collin Sexton of the Cavs is another potential candidate. However, unless things change, Doncic is clearly the Rookie of the Year. NBA All-Star Game 2018-19: Is Luka Doncic an All-Star starter?